A seven fold tie refers to how the tie is constructed. 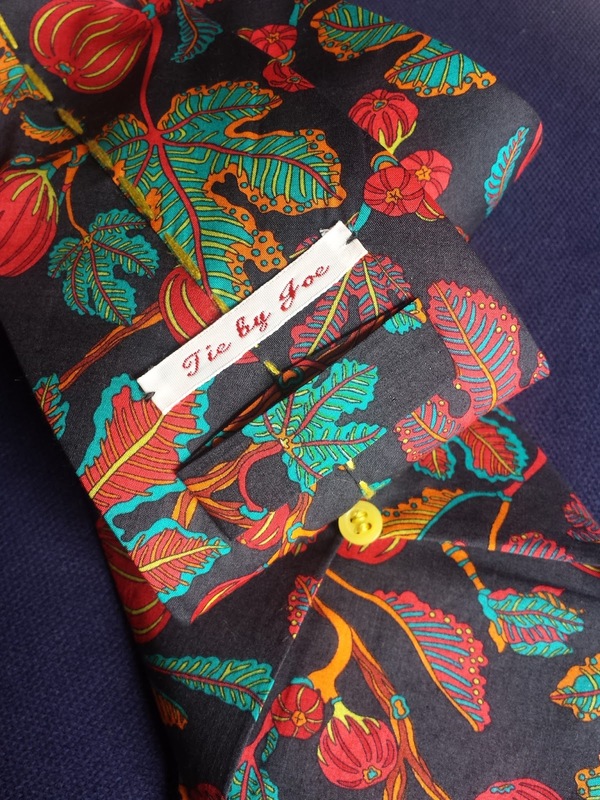 Instead of using a separate domette, or interfacing, the tie is made from one single piece of fabric that is folded seven times (the clue's in the name!) There is far more fabric required to make a seven fold tie, resulting in a weightier feel, a superior drape and a more luxurious feel. As a consequence, these ties are very expensive to buy. The extra fabric and body also help achieve larger and more consistent knots. Joe did give me a demonstration of various knots (half Windsor, full Windsor etc) but I'm afraid my mind wandered at that point. Anyway, that's what a seven fold tie is, and Joe wanted me to help him make one - I was happy to oblige. 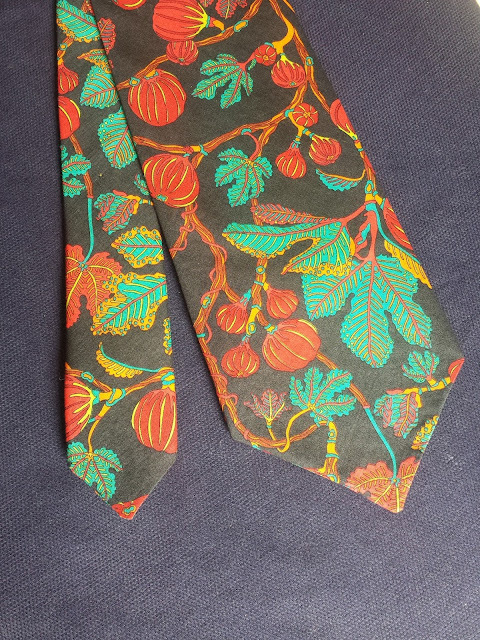 He'd come prepared and bought a posh looking tie from a vintage shop to unpick and use as a pattern. The owner assured him it was a seven fold tie, but when we unpicked it, there were only six folds! Apparently there is such a thing as a six fold tie, still luxurious, but one notch down from the seven fold in the tie hierarchy. A six fold is folded in a more symmetrical way than the seven fold (obvs) and includes an interlining. Undeterred, we made a six fold tie instead…. Ironing the tie as flat as we could, we chalked around it to get the shape, including the all-important fold lines. At this point, I think Joe was a bit worried about my slapdash tracing skills, but I was confident that a good press would hide a multitude of sins. 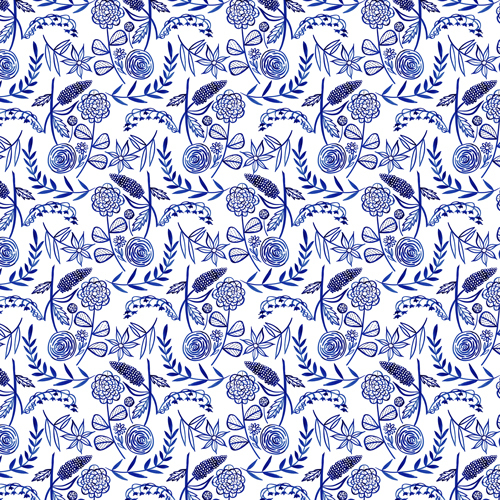 For fabric, he used this gorgeous fig design Liberty lawn from their archive collection. 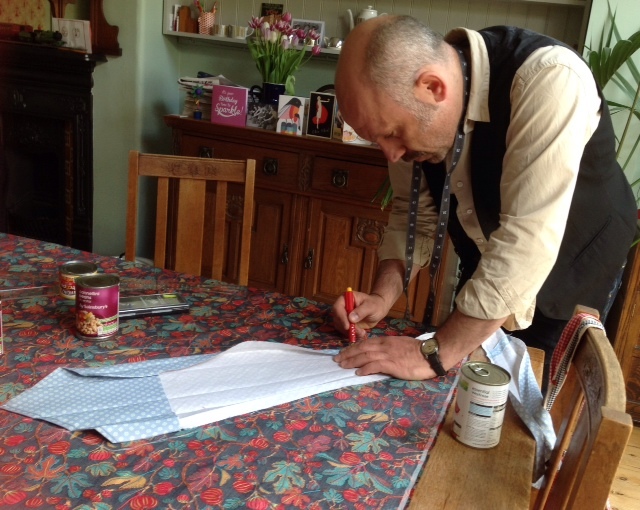 Like last time, there was very little sewing involved, most of our time was spent at the ironing board. And my prophecy was correct, pressing really does hide a multitude of sins! He soon had a very posh looking six fold tie. 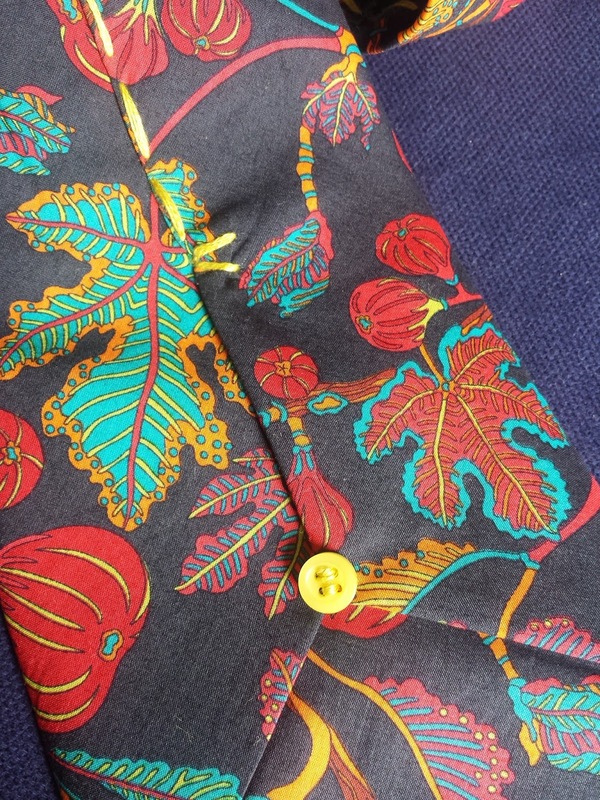 For a finishing touch, he wanted to use the same open running stitch and button feature that can be seen on this fab Italian video - how a sette (seven fold) tie is made. I rather like the finished effect, the yellow thread and button really pop against the dark background colour of the tie. There's no stopping him now, next time we'll definitely be tackling a seven fold tie. Watch this space! This is the fifth version of my favourite vintage pattern (Simplicity 4238) from 1953. It was my chosen pattern for the One Week, One Pattern (OWOP) challenge last year and I'm still not bored of it! There isn't much to add to the construction of this blouse that hasn't been said before as I've got it down to a fine art now! It's a classic, notched collar style with a great 1950's shape, which is down to the cleverly positioned darts and tucks (12 in all). The only pattern change I made was to lower the bust darts by about an inch. Let's talk about the fabric instead. I bought this goy-jus double gauze from dangerous-on-the-purse Etsy shop Miss Matatabi last year. Tragically, it's now sold out so I can't give you the link, but what I can tell you is that it's a mid-green polka dot double gauze with a secret lurking on the inside….a gingham reverse side yee-ha! Double gauze is a very soft fabric to work with and because of this, the blouse has a more casual feel than some of the others I've made. It probably wasn't the most sensible choice for this pattern as I think a bit of crispness is needed around the collar area. It turned out fine though and it's very wearable so I'm happy. I didn't use interfacing as double gauze already consists of two layers. 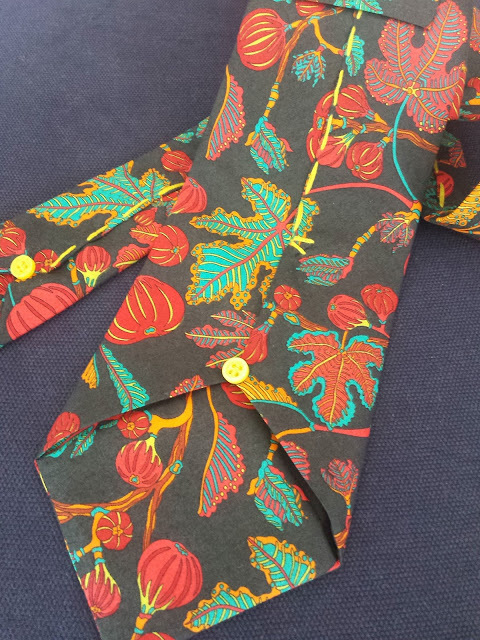 This wasn't a problem with the collar, but it was a problem with the buttonhole area. My buttonhole foot was playing up badly (surprise, surprise), so I had the horror of unpicking three half finished buttonholes. 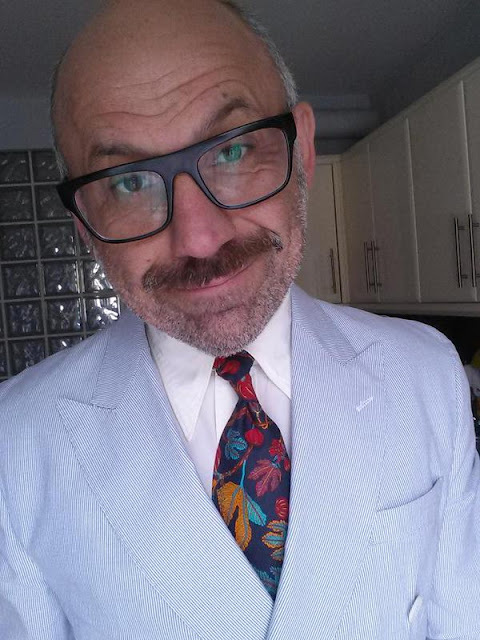 Luckily the button band is double thickness and the buttonholes were quite small as I used twitchy buttons, but it still took its toll on the fabric. Therefore my only advice for working with double gauze would be to interface any areas that need a bit of support. Oh yes, and use a fine needle too. I used self fabric binding on the armholes which is a nice contrast to the internal gingham. In fact I love all the contrasts on the inside! The lightness of the double gauze makes this a fab little addition to my summer wardrobe. I think it will also be good to take on holiday - I can see it pairing up well with my sailor shorts! 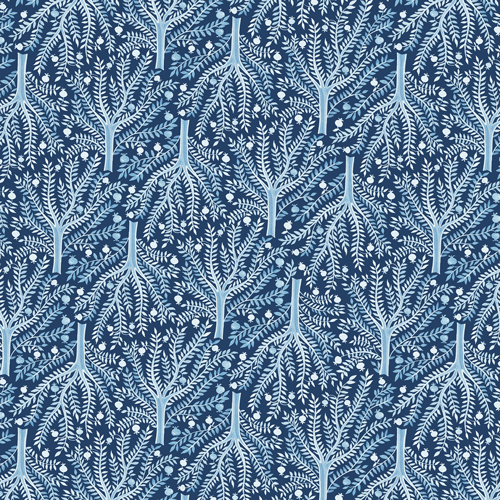 Thank you very much to everybody who entered the Moody Blues fabric giveaway. It seems I'm not the only one who likes blue, so I'm thrilled that the giveaway was so popular! 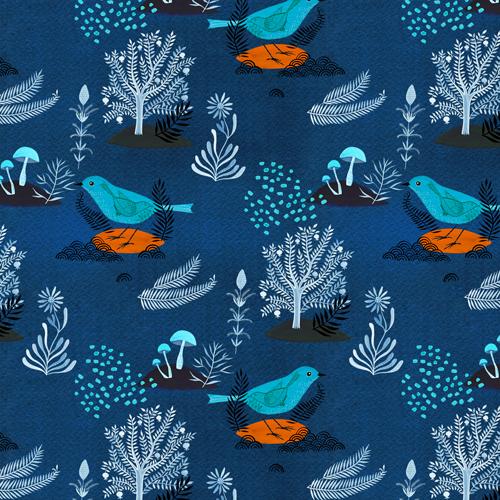 After a quick session with Random.org to select numbers I've just spent ages counting through the comments… then losing my thread and starting again….then losing count again…and again…Anyway, I finally found the two winners and they are…Suzanna Forsythe from Sea Salt and Stitches who wins two metres of Moody Blues fabric of her choice, hoorah, hoorah! 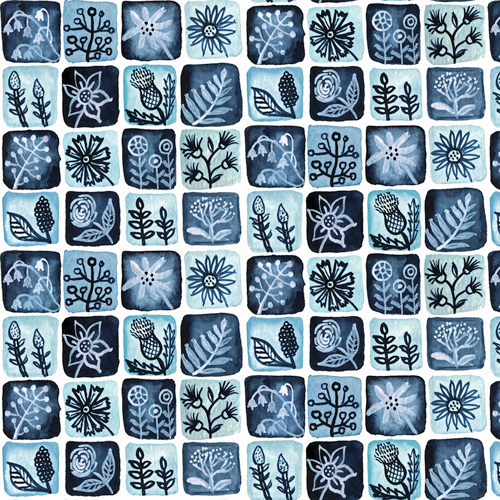 Runner up is Fiona from Staring at the Sea who wins a FQ bundle comprising eight designs from the collection, wahay! I've just noticed that both blogs have the word sea in the title - cool! Please drop me an email ladies and I'll sort out delivery details for your prizes. The idea for a chequerboard blanket came to me when I was pondering what to make for my brand new baby nephew. Initially I planned to make him a quilt, but wanted to retain the lovely fleecy backing you get on a traditional baby blanket. So I used my standard baby blanket tutorial, and adapted it to include a patchwork top. I also bound the edges with bias binding. I knew there had to be a simpler method of achieving a chequerboard top than cutting each single square individually, so I set to work experimenting with strips of paper. Not being blessed with a mathematical brain, this working out stage took ages, but I'm pleased to say it works and should save you a bit of time. I even sent the instructions to my novice quilter friend Berni, to see if they made sense to a beginner. This was a wise move as she picked up on a couple of things that needed clarifying, so thanks Berni! Seam allowance is ¼” throughout unless otherwise specified. 2. Right sides facing, sew six strips together along the long edges, starting with a patterned strip at the top and alternating with the solid strips e.g.pattern/solid/pattern/solid/pattern/solid. If you’re using a directional print, make sure it’s all facing in the same direction! 3. Do exactly the same with the remaining six strips, except this time you need to start with a SOLID strip at the top. Press seams to one side towards the patterned strips. 4. Mark across the top and bottom of each panel at 10cm intervals. The width of each panel is 100cms so it should be evenly divided into 10. Use a cutting mat or a long ruler to line up the marks to get a straight line. Cut each panel vertically as marked. Repeat for the second panel. You should end up with 20 vertical strips of fabric, each comprising six squares. 10 vertical strips should start with a patterned square at the top and 10 should start with a solid square at the top. 5. Sew two vertical strips of the same sort together at the bottom i.e. attach a strip starting with a patterned square to the bottom of another strip that starts with a patterned square. The rubbish diagrams below illustrate what the two strips should look like when sewn together. Then do the same with the strips starting with solid squares. Here's what they should look like when sewn together. 6. Press seams as above. You now have 10 vertical strips of 12 alternating squares and you’re ready to start sewing them together! TIP: lay all the strips out next to each other before you begin sewing, just to make sure they’re in the correct order. Take a photo! 7. With right sides facing, sew each column of squares together, matching seams as you go. Don’t worry if some of your seams don’t match up perfectly, I personally think it adds to the rustic charm of the blanket! 8. Once you’ve sewn the columns, press seam allowances together all in the same direction. Trim any squares that overlap the edges. You now have a patchwork top for your blanket: 10 squares wide x 12 squares long. 9. Cut your fleece fabric to the same size as your patchwork top, it should be roughly 90cm wide x 110cm long. With WRONG sides together, pin both layers together with safety pins, smoothing out the fabric widthways as you go. Use as many pins as you need to – it’s worth spending a bit more time pinning at this stage to ensure the two layers don’t shift around too much. If you have a walking foot, use it now! Stay stitch around all four edges with a ¼” seam allowance. Now we just need to bind it. I used 25mm double fold bias binding tape. 10. Open out the binding and pin the raw edge to the edge of the fabric side of the blanket, right sides together. Start about halfway along one of the short edges and pin all the way round, leaving a gap of about 5 inches from where you began pinning. Sew in place using the fold of the bias binding as your stitching guide. 11. 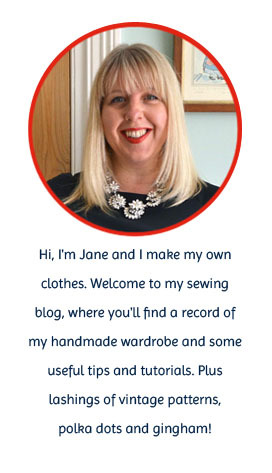 Stop stitching when you’re ¼” from the corner and backstitch (see above). Fold the binding upwards at a 90 degree angle, then fold back down on top of itself. 12. Make sure the edge of the binding is lined up with the edge of the blanket. Start sewing right from the top edge of the blanket. Repeat for the other corners. 13. To sew up the gap in the binding, fold the two edges of binding towards each other so they’re edge to edge. Mark the point where they meet and sew it closed. 14. Press open and trim the binding edges. You can now sew the gap closed as you did for the rest of the binding. 15. Trim the edges of the blanket down and turn the binding round to the reverse side (the fleece side). Pin into place, making sure the binding covers your first set of stitches. 16. The corners should have a nice mitred edge to them. Sew the binding in place all the way around, as close to the edge as you can. If you prefer you can do this bit by hand using an invisible catch stitch. Give everything a good press and you’re finished! 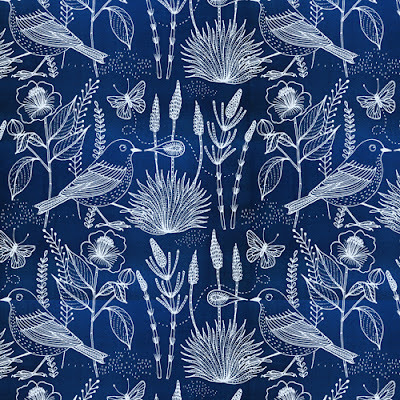 When it come to fabric choice, you may have noticed that I'm rather fond of the colour blue! It's not my most favourite colour (that would be red), but it's a very close second and I love its differing shades and how fab it looks paired up with white. 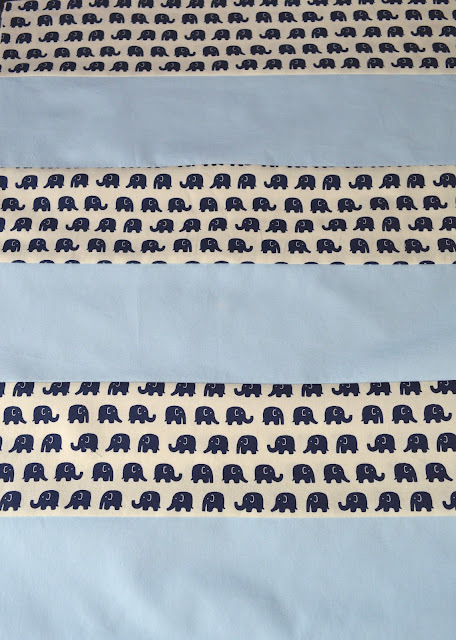 Which makes today's giveaway especially pertinent, because it's all about BLUE! 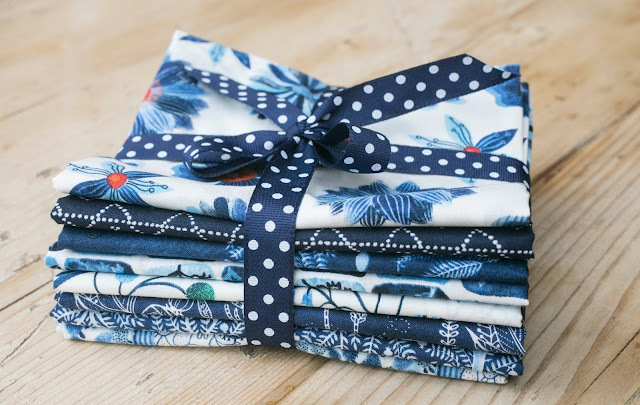 The new Moody Blues collection by Cloud Nine Fabrics has recently been released and the fabrics look absolutely perfect for either quilting or summer dressmaking. Aren't they just exquisite? 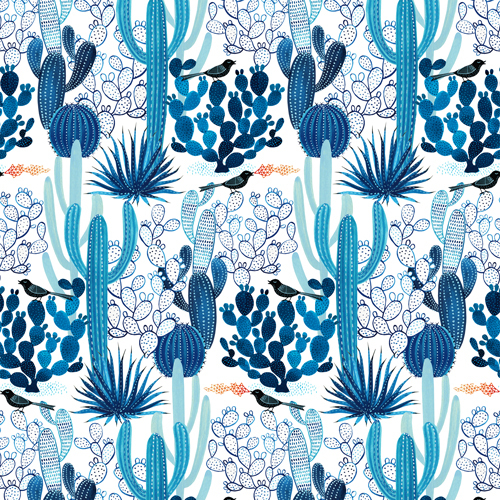 They're designed by Geninne, an artist and illustrator living in Sante Fe, New Mexico. 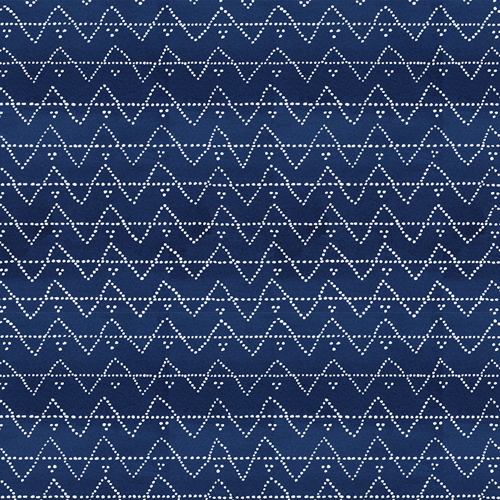 All of the fabrics shown above are available as quilting cottons, with the two designs below available as a lighter cotton voile along with Sashiko Bird Navy. If you like the look of this beautiful, new collection then this may just be your lucky day! 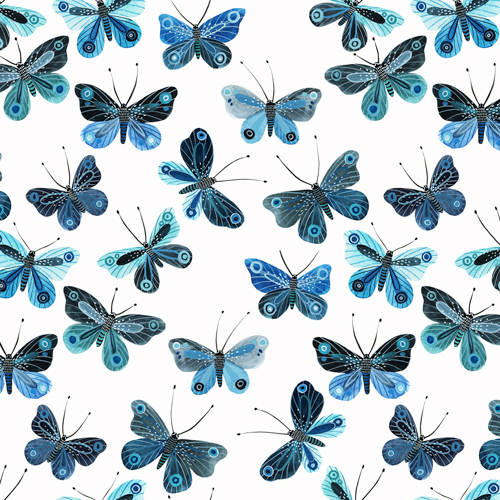 Dragonfly Fabrics are very generously offering one winner two metres of their choice of fabric from the Moody Blues collection. In addition, they're offering a FQ bundle comprising eight designs from the collection as a runner-up prize. To enter, just leave a comment on this post telling me which is your favourite design from the Moody Blues Collection. The full collection can be found here. 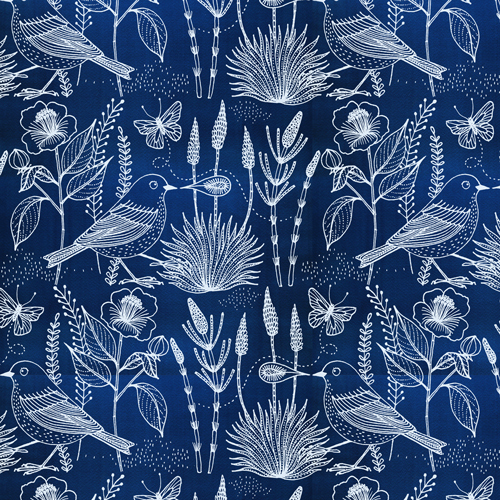 My favourite is definitely Sashiko Bird Navy in voile! The giveaway is open worldwide and closes at midnight GMT on 17th May. The winners will be chosen at random. Please make sure you leave your email address if it's not linked to your Blogger profile so I can contact you if you're a winner. But wait, there's more….! 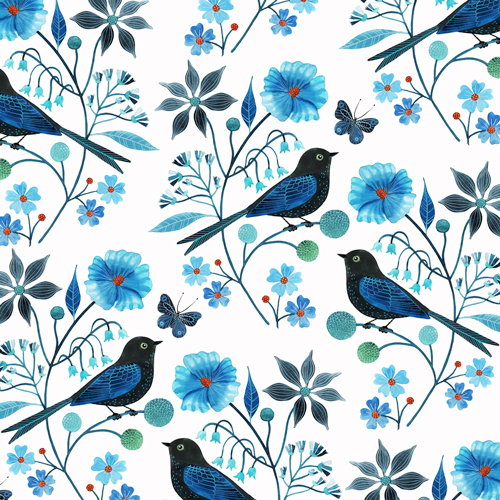 Readers of my blog can also claim a10% discount on all purchases from Dragonfly Fabrics. Just enter the code HANDMADE10 when checking out of the site. The 10% discount is valid until 24th May 2015. A massive thank you to Dragonfly Fabrics for such an awesome giveaway. 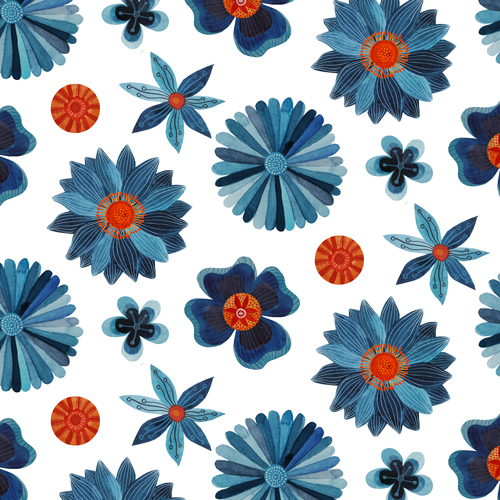 I really hope these beautiful fabrics have whetted your appetite for summer dressmaking. A new coat - but not for me!